Fair for Warm Winter Areas, but doubtful in warm, dry years. Sorry, no Locati this year. Harvests late summer - stores through spring if well grown. Locati is a silverskin (softneck braider) originally from Milan, Italy. Typical of silverskins, the bulb wrappers are very white and moderately thick but flake off easily when peeling. The cream colored clove covers have a rosy blush to them and protect long thin graceful looking cloves that are rather warm in taste, hotter than the average artichoke but nowhere near as hot as the Chinese varieties. The backs of the clove covers are tannish with a satiny purplish haze to them. The bulbs are definitely smaller in size than artichokes, but that is typical of silverskins and their inverted heart shape makes them ideal for braiding, especially since they store clean and healthy for a very long time. Locati garlics average 11 to 12 plantable cloves per bulb, fewer than most silverskins, but they make up for it by not having a lot of tiny inner cloves. They seem to be well adapted to planting almost anywhere and the uniform size of the outer cloves make them very attractive, especially for braiding. Silverskins are the last garlics to mature and harvest and are generally the longest storing garlics so you can have good garlic to eat long after most other varieties have deteriorated or gone back into the ground. Don't let the smaller size of silverskins deter you as experts have long known that the smaller ones often store better and taste better than many of the larger ones.What good are large garlics if they have deteriorated and the smaller ones are still firm and delicious? 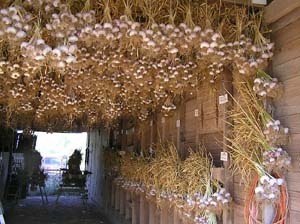 You might want to buy a few of these to eat when your stockpile of other kinds have been depleted and you can't get good garlic at your local supermarket.